AMMONNEWS - A blast at a gasoline pipeline in Mexico that killed at least 73 people has put renewed attention on the government’s strategy to stop fuel theft, with some relatives saying fuel shortages stemming from the plan led people to risk their lives. Fuel thieves punctured the Tula-Tuxpan pipeline a few miles from one of Mexico’s main refineries on Friday. Up to 800 people flocked to fill plastic containers from the 7 meter gasoline geyser that ensued, officials say. A couple of hours later, it exploded. “A lot of innocent people came here, perhaps their car didn’t have enough gasoline for tomorrow, and they said I’m just going to go for a few liters,” said farmer Isidoro Velasco, 51, who was waiting for news of his nephew Mario Hidalgo, who he believed was likely dead. Hidalgo turned 34 on Saturday. Pemex CEO Octavio Romero said on Saturday, a valve had been closed at the pipeline once a drop in pressure from the leak had been noted, but he did not say at what time that happened. 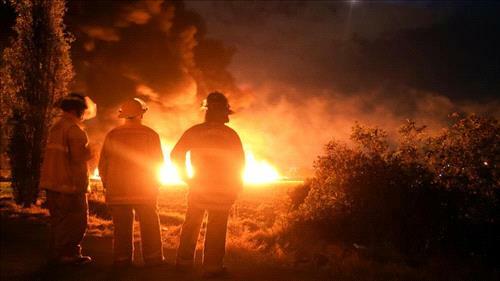 Fuel spurted from the pipeline for around two hours before it exploded, with no visible loss of pressure. Romero said the pipeline had been out of service since late December as the government tried to secure it from gangs who had hit it 10 times in Tlahuelilpan municipality. Since they began reopening it on January 16, it had been hit four times, he said.